A clean grill means even better meat! But how do you keep your BBQ clean? Simple! By using a specially made grill cleaning brush! Almost anyone who uses a BBQ will know how important it is to keep it clean, especially after continued use. A build up of BBQ grease and grime can quickly spark flare ups while cooking, and this results in burnt food, or in the worst case scenario, a fire. That’s why grill cleaning brushes were designed: in order to better clean a grill so that this problem wouldn’t happen, and boy do they make a difference! 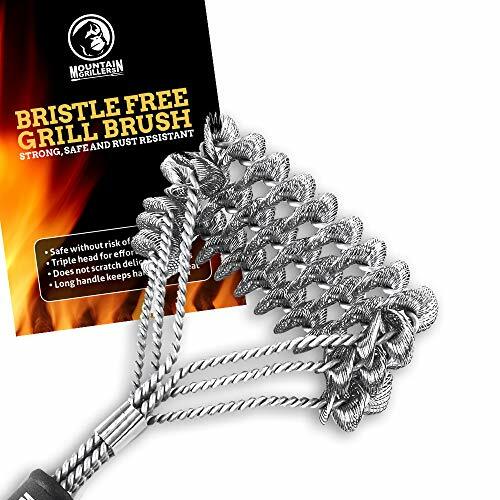 If you are interested in finding a new grill brush for your grill then you’ve come to the right place, as we share some factors to look out for before you buy, as well as a product review on one of the top grill cleaning products of the moment – the Mountain Grillers BBQ Brush. As soon as you start shopping for grill cleaning brushes, you will begin to notice a trend in the styles available: bristle and non-bristle varieties. Cleaning brushes with bristles are those which feature sturdy bristles, often made of stainless steel and which work well to scrape away old BBQ crust and grease. The problem most people find with this type of brush is that they can often shed their bristles, and this means they can end up in your BBQ. It’s better to look for a higher quality design if you decide to opt for a bristle brush, and make sure it features a safe design. A more popular brush type is the non-bristle variety as these do not have any bristles which can come loose. In fact, these brushes do feature bristles, but they have been shaped into a special design which allows them to scrub well without ever coming loose. Cleaning a grill requires you to switch it on prior to the cleaning taking place, in order to heat up the remaining dirt. When you start cleaning, the dirt seems to come away a lot faster than it would from a completely cool grill. Therefore, when cleaning a warm grill, you need to keep the brush at arm’s length in order to avoid getting burned. When looking for a cleaning brush, try to find ones that feature a long handle, at least 6 inches or more. Another thing to consider is the storage of your grill brush. You will want to keep it in a location that keeps the brush free from any dust and in a location that you can remember and won’t lose it. The good thing is that many cleaning brushes will feature a little hanging loop on the end of the handle which allows you to store it in a clean environment. Now we take a quick look at a really good quality cleaning brush on the market right now – the BBQ cleaning brush by Mountain Grillers. Are you on the lookout for a new, bristle-free brush to clean your grill? Then Mountain Grillers has the product for you. Their BBQ cleaning brush is very sturdy and cleans like a pro! We take a look at its key features below. Mountain grillers are specialists when it comes to grilling gear, and they have some pretty cool products. Their BBQ cleaning brush is a popular product, and is a great tool to have if you want a constantly clean grill. Many standard grill cleaning brushes will have bristles which can often fall into the grill and end up in your meat. When creating this brush, Mountain Grillers knew they had to avoid the standard design and create a new product which people actually want. Their BBQ cleaning brush cleans well without any leftover bristles, and is sure to clean just as good! Often, some brushes will not reach into the tougher areas of the grill, and might leave some grease and grime behind which could potentially lead to a flare up. These flare ups ruin meat by burning it and leaving a horrible taste. With the Mountain Grillers cleaning brush, the 3 heavy duty scrubbing heads make it so much easier to clean it all away, and spend less time cleaning and more time with your friends! When it comes to cleaning a warm grill, you will want to use a cleaning brush at arm’s length. This is to avoid getting burned, and where a lot of brushes are short, the Mountain Grillers one has a generous handle length of 18 inches. This makes the cleaning process a whole lot safer as it removes the chances of getting burned. 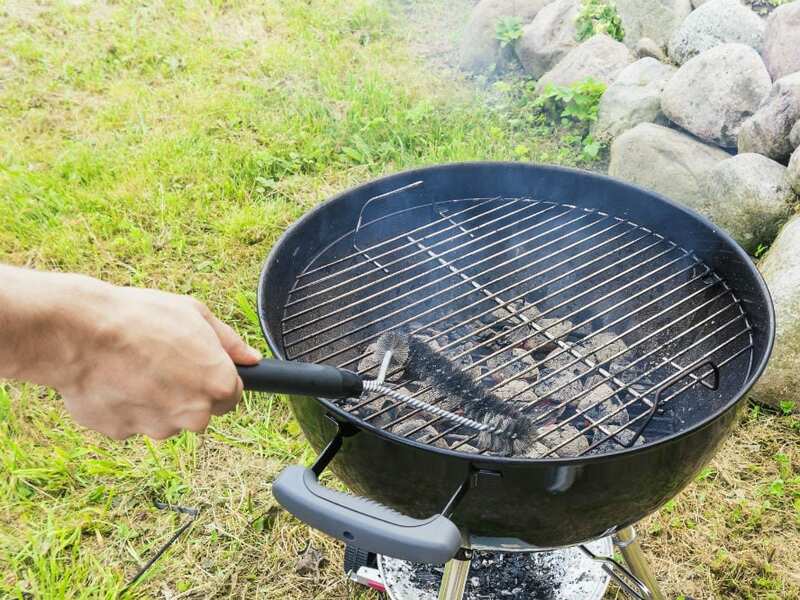 In order to keep your BBQ brush clean, there is a little loop on the end of the handle which allows it to be hung on the side of the grill, or in your shed or preferred storage space. This means it can be kept clean and you won’t run the risk of losing it. If you are looking for ways to get your BBQ cleaner this summer, then a special grill cleaning brush is the ideal product for you. Good quality cleaning brushes are not hard to find nowadays, and you will be able to find a brush like Mountain Grillers for a pretty inexpensive price. We do highly recommend the Mountain Grillers brush as it is crafted with high quality and features a safe helix construction.